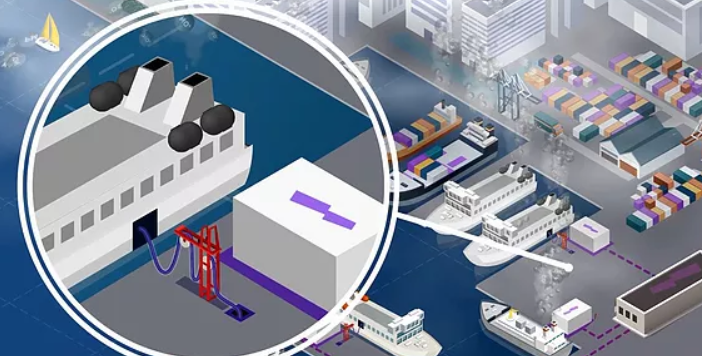 With the shipping industry entering a new, environmentally-friendly period, stakeholders in the maritime industry are seeking for ways to reduce their ships’ emissions. 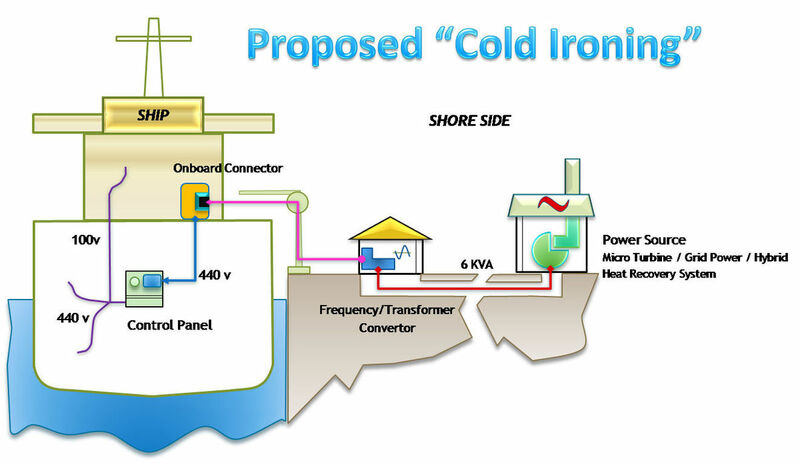 Apart from choosing green fuels and scrubbers, ports come to add another solution: Cold Ironing. This is the process of providing shoreside electrical power to a ship at berth, while its main and auxiliary engines are turned off. Cold ironing goes way back into shipping’s past, as it first appeared when all ships were using coal-fired engines. Specifically, when a ship was berthing at port, it did not have to continue to feed the fire, and the iron engines would cool down, going totally cold. This is from where this process took its name from. Nowadays however, when ships are berthed, they use their auxiliary engines to support some basic functions. This must be taken into consideration, as it generates SOx, NOx, CO2 and particle discharge as well as noise and vibration. To mitigate these issues, cold ironing comes to offer a solution. This technology is basically an anti-pollution measure, to reduce air pollution produced from diesel generators, through the use of shore electric power as an alternative. During cold ironing, the ship turns off its engines while berthed and plugs into an onshore power source. The ship’s power load is then transferred to the shore-side power supply without disrupting onboard services. With this process, emergency equipment, refrigeration, cooling, heating, lighting, and other equipment are still able to receive continuous electrical power, while the ship loads or unloads its cargo. In fact, studies have found that by using this method, many environmental and social benefits are generated. Equipment to secure automated power transfer of the ship load from the power plant on the ship to the shore-side source and back. All these factors could raise some barriers to the implementation of such a technology, as we will see below. Cold ironing mainly provides social and environmental benefits. Specifically, if the technology is implemented right, it can significantly improve the air quality, by reducing CO2 emissions. In fact, because of the high efficiency of cold ironing, and due to the facilities that cut emissions in plants, we can save over 30% of CO2 emissions and more than 95% of NOx and particulate. As a study reports, in 10 hours of stop of a cruise ship, its emissions decrease from 72.2 to 50.1 tonnes of CO2, from 1.47 to 0.04 tonnes of nitrogen oxide, and from 1.23 to 0.04 tonnes of sulphur oxide. In addition, another study has calculated the overall capital cost of installing cold ironing technology to medium-sized ports. It found that the cost would be around £6.6 m (€7.4 m), while the system would save annual emissions of 108 tonnes of NOx, 2.7 tonnes of PM and 4,767 tonnes of CO2 emissions worth £1.3 m (€1.4 m). As for the payback of this process, the report says that in the best case scenario, the external cost benefits would return the system capital and operating costs in only 7.0 years, or 3.5 years if subsidised 50% by the EU. Reduces lifecycle cost by fewer fuel consumption and maintenance cost. Nonetheless, stakeholders that are interested in installing cold ironing, must bare in mind some challenges that may occur during the process. A significant barrier can arise from cold ironing infrastructure at marine terminals. These terminals need extra electrical capacity, conduits, and the ‘plug’ infrastructure, in order to accept power cables from a vessel. For example, a large container ship may need up to 1,600 kilowatts of power while at berth, but this power can vary significantly. This fact of course raises the cost, as port electrical infrastructure for cold ironing is more expensive than a conventional terminal. On the other hand, the provision of incentives to ports to invest in this technology, such as using emission reduction credits, is a possible solution to the problem. Another obstacle could be the lack of standardization, which may lead to technical issues. This has mostly to do with the compatibility of electricity factors, as many ships do not have the same voltage and frequency requirement. What is more, the lack of legislation could set the uptake of cold ironing back. As the report ‘Key factors and barriers to the adoption of cold ironing in Europe’ notes, the absence of concrete regulation, could be one of the reasons why this technology has been implemented in few European ports. On the other side, stricter regulation in the US has led to the successful spread of shore power supply at the ports of Los Angeles and Long Beach. Continuing, the improvement and uptake of new and better engines and fueling systems, is another factor that obstructs cold ironing’s further spread. Despite the challenges that may arise from the installation of cold ironing systems, it seems that many large ports have already implemented this solution. On June 21, 2004, the Port of Los Angeles opened the West Basin Container Terminal at Berth 100. This was the first container terminal in the world to use cold ironing. Nearly two months later on August 9, 2004, the Port welcomed the world’s first container vessel to be built with cold ironing specifications, NYK’s NYK Atlas. When California mandated that at least half of all container ships run on shore-side electricity at berth, on 2014, the Port completed more than $185 million worth of dockside power hookups and other infrastructure to facilitate shore power. A partnership between the Port of Seattle and Princess Cruises and Holland America Line, resulted in important emissions reductions while vessels berth. Simply by “plugging in” to the city grid and turning off their engines, ships are reducing annual CO2 emissions by up to 29%, with financial savings of up to 26% per call. The Antwerp Port Authority wants to create the necessary conditions to supply onshore power for seagoing ships in the port. For this reason, it signed two agreements on 2018 to enable onshore power for seagoing vessels in the port area to be realized. In a major milestone for the Mediterranean, Greece’s Port of Killini accommodates the first shore-to-ship (STS) electrical supply connection in Eastern Mediterranean. The Ro-pax ferry ‘Fior Di Levante’ plugged into the region’s first shore power facility on 20 December, 2018. Cold ironing is the way that ports can contribute to reducing shipping’s emissions. By simply turning off their engines and plugging in to an electrical supply point in the ports, ships can instantly become ‘greener’. It remains to be seen how this technology will be able to service more types of vessels, in order to improve the sector’s environmental footprint.